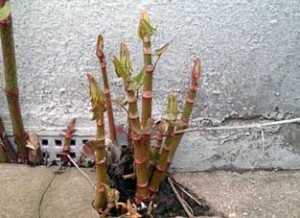 Japanese knotweed is a common enough problem so why not try to kill it yourself? Many people do, and some of them probably manage it with relative success. However, due to the complex legal issues surrounding knotweed and its impact on property, any DIY knotweed eradication effort will not protect you from the potentially costly legal consequences. In fact the whole reason there is a knotweed contractor’s trade body and detailed guidance for surveyors is due to banks and building societies needing knotweed risks to be managed professionally. This is particularly important if you are looking to buy or sell a property affected by knotweed (which, incidentally, need not be on your land – growth on a neighbouring property could affect you too (read this blog post about buying knotweed affected property)). Nevertheless, if such risks are not a concern then there are a number of things you can do to kill knotweed, or at least significantly reduce its spread, yourself. There is a wide range of herbicide products available to the general public from your local garden centre. The important thing is to make sure that the product you use is still in date and that you carefully follow the instructions on the label. Some products will go out of date and their active ingredients may be withdrawn from approved use, so it is probably safest to go out and buy a product specifically for the intended purpose. To that end, most products will provide a list of plants that they are intended to treat, so make sure that Japanese knotweed is listed on the label. The products available to professionals, who have to pass a series of exams in order to apply them, are much stronger than those available to the general public. You can therefore expect your own DIY treatment to take several years longer than the results obtained from a professional. The generation of rhizome fragments from excavating soil close to, and often several metres away from, knotweed plants and their potential spreading in the spoil arisings is the main mechanism of dispersal that has led to the proliferation of knotweed across the UK, Europe and North America. Therefore, extra special care needs to be taken in any situation where there is a risk of disturbing and fragmenting knotweed rhizomes. Due to the ‘iceberg’ nature of the extensive and wide-spreading rhizome system, it’s very easy to do this without realising. If you do, you risk breaking the law or opening yourself to litigation by spreading knotweed propagules. If you are happy with the risks, digging up the rhizome system is the most immediate way to kill Japanese knotweed. However, dealing with the fragments can be more problematic. Ideally they should be removed from site and disposed of at a licenced waste facility. A skip hire company can usually handle this, but expect costs to be several thousands of pounds per load. Special care still needs to be taken in handling the waste to ensure that rhizome fragments are not spread. There are a range of other Japanese knotweed removal options following excavation that professionals utilise, such as burial and screening, but it’s not recommended that these are attempted as DIY projects. We realise that it is tempting to deal with Japanese knotweed infestations yourself – it is only a plant after all. However, the potential risks of prosecution, diminution in value of property and litigation make it much less attractive an option. If you are in any doubt, the peace of mind gained from using a professional with established qualifications cannot be over emphasised. Phlorum was a founding member of the trade body that was established in consultation with the Council of Mortgage Lenders and the Building Societies Association to deal with property risks caused by Japanese knotweed. We were also part of the working group that produced the RICS guidance on knotweed surveys. We offer the full range of knotweed solutions, from surveys, consultancy, legal advice and ‘boots-on-the-ground’ site works. If you have a knotweed issue that you’d like to discuss, please contact us. We also have a FREE knotweed identification service where you can send us photographs of your suspected plants for a quick consultation. We are here to help but we will respect your decision however you want to deal with your Japanese knotweed problem.